MANILA (REUTERS) - Growth in Asia will likely be slower than previously thought as a slowdown in China's economy hurts demand, the Asian Development Bank said, and urged policymakers in the region to strengthen financial-system buffers against external shocks. The Manila-based lender cut its 2015 growth estimate for Singapore to 2.1 per cent fron its earlier forecast of 2.8 per cent made in July. Its 2016 growth forecast for Singapore was also slashed to 2.5 per cent 3.4 per cent. ADB cut its forecasts for East Asia to 6.0 per cent for this year and next, from its earlier number of 6.2 per cent for both years, with China expected to miss its growth target of around 7 per cent this year. Growth in China is seen cooling to 6.8 per cent this year from 7.3 per cent in 2014, and slow further to 6.7 per cent in 2016, the bank said in its 2015 outlook update released on Tuesday (Sept 22). Fears of a China-led global slowdown, which had sent global stock markets tumbling, prompted the US Federal Reserve last week to hold off on raising interest rates for the first time in almost a decade. "Implementing macroprudential policies and developing local currency bond markets can bolster financial system resilience and mitigate risks to borrowers," it said. Southeast Asia's growth will be at 4.4 per cent this year, same as last year and down from its July forecast of 4.6 per cent, before accelerating to 4.9 per cent next year, the ADB said. India's growth is seen weaker at 7.4 per cent and 7.8 per cent for this year and next compared with its July forecasts of 7.8 per cent and 8.2 per cent. 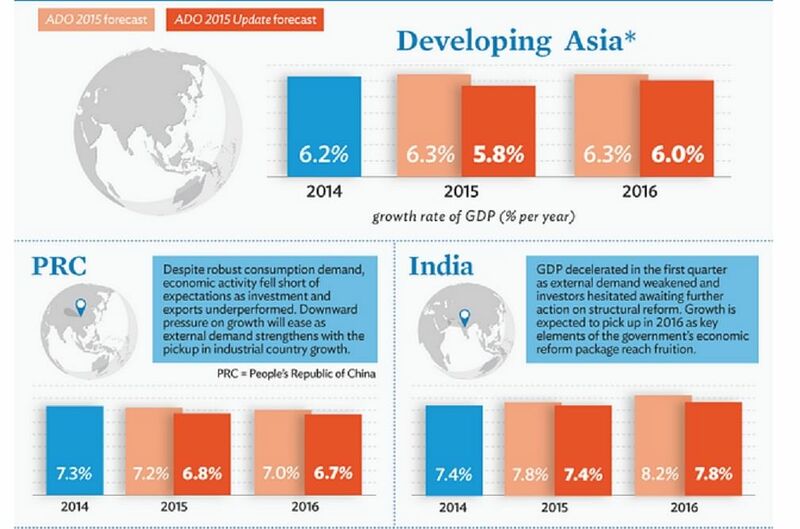 The whole of developing Asia is now expected to grow 5.8 per cent and 6.0 per cent this year and in 2016, down from the ADB's July forecast of 6.1 per cent and 6.2 per cent. The region, which groups 45 countries in Asia-Pacific, grew 6.2 per cent in 2014. The ADB slashed its growth forecast for South Asia to 6.9 per cent this year and 7.3 per cent next year compared with the 7.3 per cent and 7.6 per cent estimates made in July. Inflation in the region in 2015 is now forecast to be a slightly lower at 2.3 per cent, compared to the 2.4 per cent seen in July, before it bounces back to 3.0 percent in 2016. The report is available on the ADB's website www.adb.org.